Northern catalpa is primarily used today as a large ornamental shade tree. It is widely planted in urban areas as a street and lawn tree. Conservation uses include plantings in mined-land reclamation projects and shelterbelts. 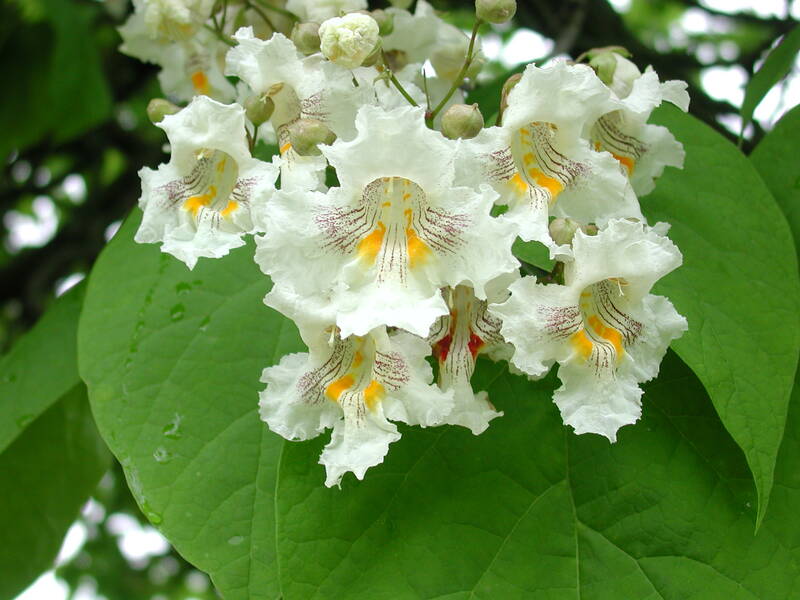 The large, heart-shaped leaves and abundant, showy-white spring flowers give catalpa a tropical appearance. Fortunately, the tree is much hardier than it appears and can even be grown in the far western reaches of the state. Catalpas prefer moist, deep, well-drained soil, but adapts to dry or wet soils. It also prefers an open sunny space to partial shade. It is tall with an irregular, open-rounded to narrow-oval crown. This tree comes into leaf very late in the spring and it is one of the first to lose its leaves in the fall. Its longevity is about 60 years. Positive attributes of catalpa include its drought tolerance, soil adaptability, fast growth rate, attractive flowers, and distinctive long seed pods. The tree bark ranges from scaly to ridged, to blocky plates. On young tree seedlings, the bark is thin and easily damaged by impact, or rodent. The flowers of catalpa are perfect. Flowering takes place in late spring to early summer. They occur as large clusters of showy, white, bell-shaped corollas of 5 lobes with ruffled edges and yellow, orange or purple interior spotting or streaking. The flowers are cross-pollinated by bees and various moths that are nocturnal. Other insects such as skippers, ants, and flies are also visitors but aren't effective cross-pollinators. When placed as an ornamental in a yard setting, care must be taken to ensure it is not too close to a building, fence, property line or septic system. Ample space should be provided to let it reach a mature height. It is an invasive, weedy tree which escapes cultivation easily. The flowers, long seedpods, and seeds fall down from spring through winter and create a mess on the ground anywhere near the tree. Its brittle wood makes its branches subject to wind and ice damage. It is sometimes planted to attract the green catalpa worms, which are prized fish bait. These caterpillars can be frozen and used as bait at a later time.